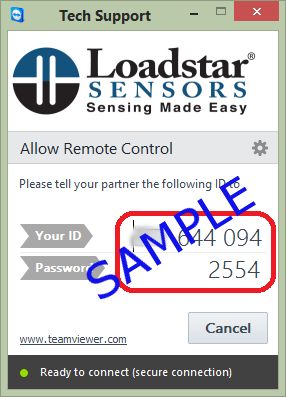 If you have sensor connectivity or software issues, in many cases it is easier for Loadstar Sensors to assist you if we are able remotely view your computer screen. This can be done through the use of screen sharing software. A window similar to the following will come up showing an ID and password. Please call us with the ID and password information and we will be able to look at your screen. There is no danger of unauthorized access to your computer since the software must be running. In addition, the password will change every time you run the program. Note: Access to your computer may have been disabled by your company. If this is the case remote support via screen sharing is not possible.